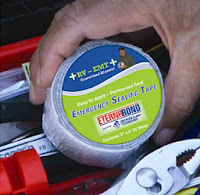 Robert, Eternabond tape can be applied directly over the old lap sealant as long as it spans it completely on both sides, with an inch or so on either side of the extreme edges of the lap sealant. It does replace the lap sealant and no other sealant will be necessary. Just be sure to follow the directions explicitly during the application. Clean, dry, etc. The only thing Eternabond will not stick to is silicone sealant. If there is any silicone sealant used, I recommend removing that first. But no other sealant need be applied to the edges of the Eternabond. Great stuff!